Janus is one of the playable Gods in SMITE. Many fear change. Venturing into the unknown. Deviating from a path of safety and certainty into something unexpected. But life is change; a journey through doorways both physical and emotional, with every moment a passage to something new, and it is Janus, God of Portals and Transitions that governs this. Bearing two faces, Janus is ever looking to the future and to the past, knowing both but controlling neither. He is only the in-between, found in the changing of seasons, at the birth of a child, at the entrances to the temple and the tavern. For this reason the Romans named the first month after him: January – a portal between the old year and the new. Yet the Roman emperors also attribute a strange tradition to Janus. At each end of his temple stand massive doors. In times of peace, these doors are closed, but in times of war, flung open. As Rome rose to power, rarely were these doors shut, but almost four hundred years of peace have clothed Rome since then and the temple has grown dusty with absence. These days, however, the doors are open once more. It seems war has returned, and the greatest of changes are upon us. Janus creates a portal in the world. If placed on a wall, the portal will create a passage through to the other side of the wall that Janus or any ally may use. The portal may be entered from either side, but closes after 1 use. If placed on the ground, enemies and Janus will fall into the portal, being teleported into the air above it. Enemies take damage upon landing, and are considered banished during the fall. Can be placed on Phoenix pedestals. Portals can't be used by gods who are Stunned, Crippled or Rooted. Janus won't fall through his ground portals while CC immune. Passive: Janus increases the movement speed of himself and allies each time they go through a portal or over a Threshold (max. 2 Stacks). Active: Janus opens a multi-dimensional rift. Enemies who pass over the rift are slowed, and marked with Phase. Targets in Phase take additional Magical scaling damage when hit by Janus' damaging abilities. Phase slow lasts for 3s. The additional damage is dealt as a separate tick from the ability that triggered it. The buff/debuff is only applied once per cast. Rift Duration: 3/3.5/4/4.5/5 Movement Speed: 10/15/20/25/30% per Portal. Janus blasts a ball of multi-dimensional energy across the battlefield, burning a portal into every surface it encounters within range 500. These portals last 10s, may be used by allies, and do not vanish after the first use. Enemies hit by the energy ball take damage, increasing in Magical scaling the further the energy travels. Janus is immune to Crowd Control whilst firing. The portals have no range restriction. Each ally can only use each portal once. Damage: 300/400/500/600/700 (+75% of your magical power) Distance Scaling: 100% of your Magical Power at distance greater than 800. Janus doesn't have an greek counterpart. Janus was originally meant to carry a key as his weapon, but the idea was scrapped during development. You can still find a smaller version of the key hanging from his belt, and you can see the full size key in his default skin card. One of Janus' taunts, "You shall not pass!.. through my portals that is. ", is a reference to a quote made by Gandalf from the Lord of the Rings series. One of Janus' lines for when he is in low health, "Curse my body, I wasn't fast enough. ", is a reference to a quote made by C-3P0 in the film Star Wars: A New Hope. Janus direct taunt to Athena "They named a whole month after me, you only got a city!" is a reference to how in the Roman Calendar the first month of the year is named after him. 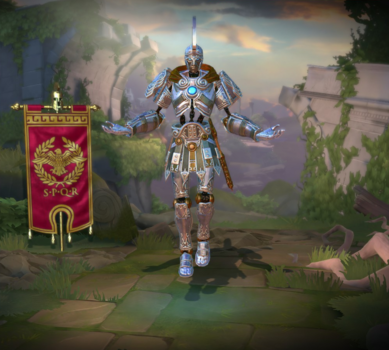 Janus' Defeat Screen animation is a reference to the American animated cartoon Scooby-Doo. 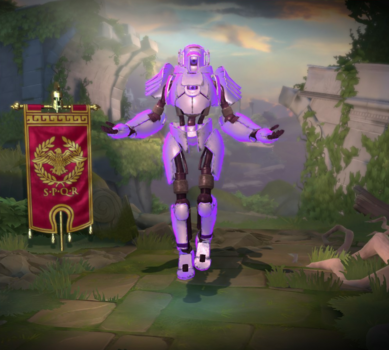 The names of this skin is a reference to the 1984 film, Ghostbusters. Curiously, this skin and Timelord Chronos share the same color scheme. This skin is a reference to the first-person puzzle-platform video game, Portal. The actor who voiced this skin, Christopher Niosi, also voiced K-9 Anubis and Captain Quick Mercury. This skin share its theme with Divine Beats Amaterasu, DJ Ohm Ganesha, Basscannon Neith, Electric Dream Nox, Ravin' Ravana and Heaven's Rave Zeus. 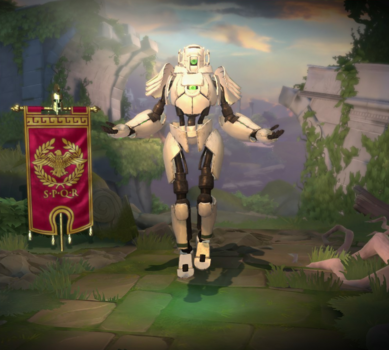 Being part of this set of skins means it has a [VXG] (Special Emote) comand that will play along with other skins of the same set. The actor who voiced this skin, Sean Chiplock, also voiced Jackal Knight Anubis, Fabulous Chiron, and Warchief Raijin. This skin is based on the animated series Transformers. 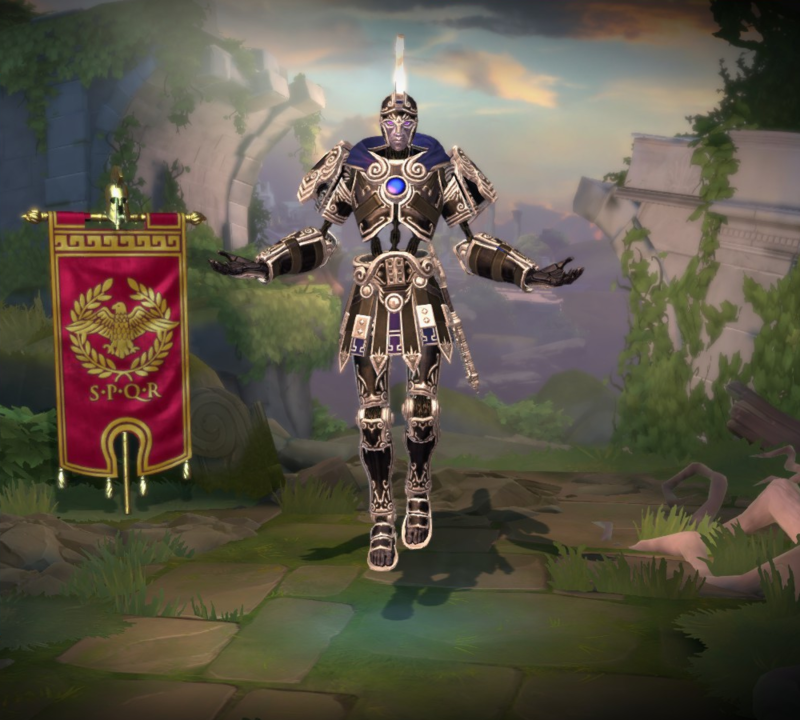 This skin share its theme with Tremor Tech Cabrakan, Storm Tech Chaac, Dual Tech Hel, Revenge Tech, Omni Tech Odin, Reaper Tech Thanatos, Ragnarok Force X Thor and Sky Tech Zeus. 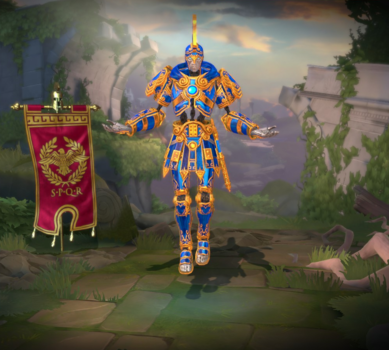 The skin, its ability targeters, and ability effects constantly rotate between several colors. This skin was part of the Odyssey 2016 event. This skin is unlocked with a special code you get by going to the skin's promotional page in SMITE eSports and selecting your platform. This skin was unlocked with a special code you could get from Twitch Prime. Raised volume fx for Basic Attack and ability #2 for Warp Tech skin. Increased Cooldown from 8s to 10s. Decreased Bonus damage from 20% to 15%. Decreased Duration of the deployable from 3/4/5/6/7s to 3/3.5/4/4.5/5s. Changed the FX for the portal deploy to better match its actual deploy speed. Increased Base Damage from 90/150/210/270/330 to 100/165/230/295/360. Increased Magic power Scaling from 70% to 80%. Decreased double hit bonus from 30% to 20%. Old Damage Total: 117/195/273/351/429 (+91%). New Damage Total: 120/198/276/354/432 (+96%). Increase Base damage and Scaling from 200/300/400/500/600 (+50% of your magical power) to 300/400/500/600/700 (+75% of your magical power). Decreased Scaling Damage per distance traveled to cap out at 100% additional Magical Power Scaling at 800 Units, down from 200% at 800 Units. Increased Cooldown from 90s → 110s. Reduced Magical Scaling bonus from 25% → 15%. Fixed players T-posing when having gone through portals multiple times. Reduced Phase Slow from 20/25/30/35/40% → 25% at all ranks. Fixed Janus ultimate not placing portals if used close to a wall. Fixed debuff tooltip showing incorrect icon. Fixed issue with Furious animation. Can now place portals on Phoenix pedestals. Fixed Diamond skin showing partially invisible to other players. Fixed exploit getting gods on top of collisions. Corrected an issue where players falling through enemy portals could still use Aegis. There is now a visual FX on Janus and Allies when they are affected by Threshold's speed buff. Cooldown reduced from 15s to 12s. CC Immune targets will no longer take damage from this ability after avoiding the banish. Damage for hitting the second vortex reduced from +50% to +30%. Magical Damage Scaling reduced from 80% to 70%. Adjusted aiming on this ability to improve player accuracy. Fixed an issue where players who were knockup immune, and Loki while stealthed, would not be banished by falling into the portal. Note: This means most gods who are dashing will also fall into the portal, and is a substantial buff to this ability. Fixed an issue where players could use jump to avoid being banished and falling into the portal. Reduced slightly the maximum distance the projectiles will pull away from each other during travel. Janus can now move and aim while channeling this ability. Janus is now CC Immune while channeling this ability. This ability now deals damage to everything but Titans. This is a temporary fix as we explore improving Titan leashing logic in later patches. This ability will no longer deal damage to players in fountains. Janus has been added to the game. Reduced additional scaling damage from 20/40/60/80/100% to 20/30/40/50/60%. Increased cast time from 1s to 1.5s. Increased recovery time from 0.1s to 0.3s. This ability now only damages gods.